The single greatest misconception people have about memory is that it works like a camera. That would imply that your brain automatically creates objectively accurate records of everything it experiences. Nothing could be farther from the truth. In many cases, your brain will not remember something until it has interpreted it in a personally meaningful way. For the most part, remembering something demands your full, active participation. “Objective memory” is an oxymoron. Never underestimate your ability to forget. Your whole life — at age 5, 15, 35 — you’ve demonstrated expert skill at forgetting things, and you’ll remain that way until the end of your days. How does it help to know that? For one thing, it changes the questions you have to answer. Instead of asking “Why do I forget?” maybe what you should really be asking is “Why do I remember?” That question has many answers, but if you’re worrying about your memory the simplest answer is probably this: because you paid attention. The memory systems of concern here – the ones that most people are concerned about – are ones that are accessible to consciousness. Those are the memory systems that handle memories of facts about the world (sometimes known as “knowledge”) and more personal memories of doing a certain thing with a certain person at a certain time. The older you get, the more knowledge you have, for the most part. So why do people complain about their memory as they age? In part because it becomes harder for the brain to learn and remember new things. That seems surprising, in a way. After all, if you remember things by interpreting them in a personally meaningful way, the more experiences you have had in your life the easier it should be to do that. The main reason it becomes harder to learn new things is that your brain’s processing speed gradually slows. It becomes harder to do more than one thing at once, so it’s easier to get confused. Your brain may also become less flexible, so it’s harder to change learning strategies in mid-stream. All these things mean it becomes harder to focus. There’s nothing you can do to change your brain’s processing speed. So far, researchers haven’t found a way to upgrade your brain’s hard drive the way you can do with a computer. But there’s a lot you can do to increase your learning performance even if your processing speed has slowed. It’s all in the techniques you apply. Sensory awareness is intimately tied to focus and concentration, as well as to memory. After all, it’s your senses that convey to your brain what it is that you want to remember. The first thing you’ll notice is that there seem to be dark spots wherever the white lines intersect — but they disappear as soon as you try to look directly them! They’re not really “there” in the image itself. It’s your brain that’s creating them. 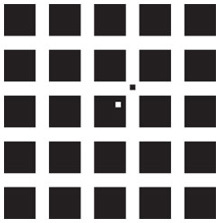 Next, focus on the black dot for about half a minute. Then focus on the white dot. You’ll notice that another black grid appears that you couldn’t see before. You’ll also notice it’s moving a little.